What i love more from flickr , is that gives me the possibility to get to know amazing creative people with cool ideas. make a pic of yourself with the book you are reading and listening to some music. I have always respected people that have choosen to lead a lonely life. And by this i don't mean asocial people , people that find it hard to get in touch with the others of course. I mean the people that content theirselves and don't need other people just because they don't like being lonely. Yes , maybe you find it strange , but i have came across a lot of of these people. I don't like their company.I guess because they make me understand they aren't enjoying mine as well. Or maybe because they need my friendship anyway, because they just can't stand to be alone. I find it so superficial. One should first get enough of his/herself i think. If you see people , if you get in touch with them just to escape from your loneliness and boredom , you aren't going to do anything good to yourself or the others. Loneliness should be experienced sometimes. Loneliness offers you the luxury of an intense conversation with your innerself. This conversation might hurt sometimes.Sometimes it might get your worse. But at the end of this experience , you won't have anything to escape from. You'll have signed a total piece with yourself. And once you have achieved this ; you'd be able to pass quality time with yourself only or with others as well. You won't experience something in order to escape from something else , you'll really be able or be willing to share what you want with the others. But in order to reach this , you need to master your loneliness; this very slight line that separates your true preferences from your egoistic fears. Can be sometimes felt in a waterdrop! Ajo ç'ka e ben te veçante Stambollin, kete qytet te madh te njohur me bukurite dhe problemet e çdo qyteti metropolitan, nuk eshte vetem madheshtia e tij kulturore,natyrore,historike , por disa zakone apo menyra jetese te veçanta per kete qytet. Jane keto te fundit disa gjera qe çdokush i di se mund te behen vetem ketu , ose se paku njerezve i pelqen me shume ti perjetojne ketu. Njera prej ketyre eshte dhe zakoni i te ngrenes "buke me peshk" prane barkave qe ndodhen prane bregut te detit Marmara. Me te njohura per kete dhe me nje histori 60 vjeçare jane barkat qe ndodhen ne lagjen Emineny(Eminönü) nje nga lagjet me te vjetra te Stambollit prane ures se Gallates. Ky ritual u ndalua para disa vitesh nga bashkia e Stambollit per arsye ndotje te ambientit por u rihap serish pas 3 vitesh pushim ne veren e vitit 2007. Sigurisht , ndonese ky zakon nuk perjeton me lavdine e dikurshme , pasi se pari barkat nuk jane ato barkat historike qe kane qene me pare, qyteti eshte me i zhurmshem , trafiku dhe kallaballeku ben te veten , por prapese prape eshte diçka qe duhet provuar patjeter. Çfare e ben kete ritual kaq interesant do te thoni? Por ja vendondodhja , barkat interesante, sherbimi nga persona te veshur ne menyre tradicionale , çmimi i lire (2 € nje sandviç me nje peshk te madh shumicen e rasteve koce ose levrek+ sallate) , gjalleria e ambjentit ku ndodheni . Ata qe gatuajne peshkun ne zgara qe ndodhen brenda barkes , duhet te kene nje ekuiliber te shkelqyer besoj , pasi barkat ka raste tunden e shkunden per qejf te vet.Shpesh duken sikur jane duke marre pjese ne nje maratone me pengesa. Sandviçi pregatitet shpejt e shpejt dhe vjen ne duart tuaja midis nje "korrieri" te shkathet qe e kalon tere diten e tij me gjysmen e trupit te anashkaluar keqazi sa qe trembeni shpesh se mos do te bjere ne uje. Shqetesim i kote ky , per njerez te tille qe kane perfituar nje zhdervjelltesi te çuditshme nder vite. Per kete arsye nuk eshte fare çudi qe ky lloj ushqimi "fast food" eshte mjaft i preferuar si nga turqit edhe nga turistet. Nese do t'ju keshillonin te vizitoni patjeter aksh muze dhe filan vendi historik , kijeni parasysh se do t'ua thone edhe kete. Most of you might have heard of the famous Icelandic geysirs.They are located on the country's south west part.It's there that you can experience the magic of fabulous steam rising from the hot springs, vent and streams found all over this area. Actually , all of the hot springs world wide are called due to the great Geysir located here.It's been told that Geysir has been erupting since the early 14th century up to the early days of 20th century.It hasn't been active since then. According to some ,Geysir stopped because lots of rocks has been threw to it to set it off.Some say , it just stopped . But when it used to erupt ; it's been told it used to go 150-200 feet high. Sure Geysir has a little twin:) called Strokkur. Strokkur of course is not as big as Geysir used to be and when it erupts the steaming water goes 60-100 feet high.It happened once in 5-10 minutes. 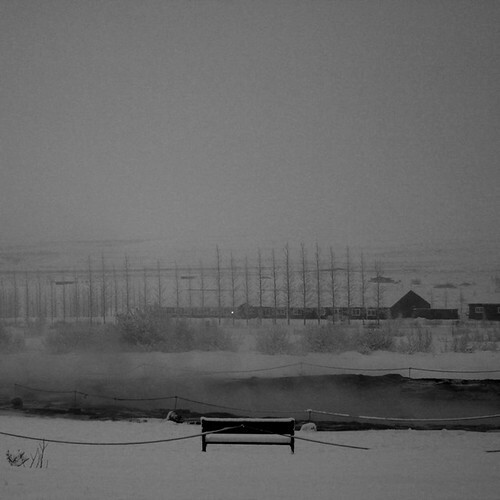 The area of geysir was surrounded and you couldn't get closer than that . I sure was thankful to my best friend (my camera;) that helped me get every single second , when it started to erupt. But you can see from the photos , the amazing moment it gets ready to erupt and all it's phases.The first moment can be seen on the picture on top. The other photos show the continuous moments. It was really an amazing experience. Also what i loved else , was the perfect nature harmony and the combination of the places full of snow & hot springs with boiling water.It's truly incredible to see these both together.